Greetings Creative Souls!! We have officially stepped into 2014 with wide open arms, and I don't know about you, but I am SO ready to tune into my creative wisdom and fulfill a year that satisfies the artist within me. Now, I'm not just talking about art-making; I'm talking about sparking your inner, creative genius from the depths of your heart and letting it shine and extend out through your fingertips, on to the canvas, and all the way out to all facets of your life. If there is one person that embodies this, from the inside-out, while influencing the creative community through music and dance, that would be the beautiful, Lisa Beck!! CREATIVITY IS YOUR BIRTHRIGHT. OWN IT. We are brilliant, imaginative, wild creators. We were born this way. We just don’t quite grasp our magnificence. I spent a lot of precious time in my younger years creating stress, doubt, lack and victimhood. I also created a lot of joy, fun, and adventure…but underneath it all I held the belief that my experiences were creating me. I was being tossed around and I had no control. This was the illusion I created. Now I know the truth. I am a creative genius. You are a creative genius. There is no limit to what you or I can do in this life. You see, when we believe something we make it real. What do you believe? What beliefs are you holding onto that continue to attract the same situation and the same people over and over again? When I find myself in a negative loop of disappointment, desperation, frustration, etc., I get in touch with underlying beliefs and limiting thoughts that might be holding me back from my joy. When we realize and activate the truth of our power and brilliance, the fun begins. Not only do we create our experience, we get to make it as colorful and magical as we want it to be. We have this power. It is the same power that created life as we know it. It lives within each of us. We have the opportunity in each moment to let go of limiting beliefs and create experiences that show us how fabulous we truly are. What are you creating? What do you believe? What are your deepest desires and what is blocking you from experiencing them? Are you ready to let go of what holds you back and create something really amazing? This takes work. This takes practice. This takes patience. There is no room for guilt. Instead of beating yourself up for falling back into old patterns, simply observe and take notes. This life is a classroom. Be the observer. Be patient and trust. Keep moving ahead and let the guilt go. Celebrate your creations. Gratitude journals are great for this. Every evening before bed, give thanks for the amazing people and joyful experiences you have created. Pat yourself on the back and acknowledge your creations. Surrender. I have been so guilty of trying to make things happen exactly the way I want them to. Time and time again I come up against a wall of my own creation. Frustration and impatience breed more frustration and impatience. Surrender and know that your dreams will unfold in beautiful and magical ways when you let them go. Love and forgive yourself. Make this a daily practice. Treat you like the queen or king that you are. Self-love and forgiveness are keys to success in this life. Be gentle and kind and nourish your body, mind, and soul. Your creativity is a gift from the universe. Use it. Nurture it. Cultivate it. Celebrate it. Own it and be grateful for it. Lisa Beck helps people feel more alive, energized and joyful in their bodies through dance, music, and radiant wellness. She leads ongoing classes, workshops and women’s retreats and performs throughout Southern California. 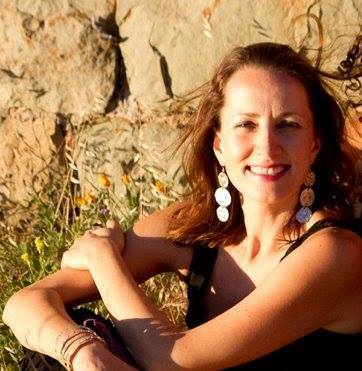 Lisa is the co-director of Panzumo Rhythm, Song, & Dance, an entertainment and education company based in Santa Barbara. She is also the creator of Djun Djun Mamas, an all-female drum & dance troupe. Find out more at her home on the web: www.LisaBeckLiving.com. Connect with Lisa on Facebook, Twitter and Instagram (@LisaBeckLiving). I'VE ALWAYS BELIEVED THAT WE ARE ALL ARTISTS ON A SOULFUL LEVEL AND CREATIVITY, AS OUR BIRTHRIGHT, SERVES A HIGHER PURPOSE IN OUR LIVES. HOW DOES CREATIVITY PLAY A ROLE IN YOUR LIFE? PLEASE SHARE YOUR COMMENTS BELOW!